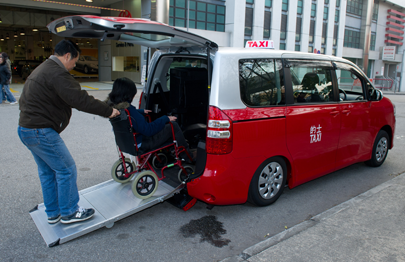 Diamond Cab vehicles are Toyota Noah Welcabs, which are specially designed for wheelchair accessibility with a mechanic ramp at the back. A maximum of two wheelchair users can be accommodated on a single trip with their two carers. The cabs are regulated by the taxi licensing authority, which stipulates that a maximum of five passengers can be transported on a single trip. Diamond Cab runs 24 hours a day but advance booking is preferred in order for us to best arrange our services. As a pilot operation with five cabs, all routes involving Hong Kong Island and New Territories will have Zone Surcharge because the shift change location is in Kowloon. Point-to-Point Charge: Starting from $115 Our call centre will quote an exact fare after you call in; the fare may include zone charge. Hourly Rental: $300 per hour with minimum booking of one hour. Once a booking has been confirmed by our Call Center, any subsequent cancellation made within 48 hours before the booking time would incur a $100 cancellation fee. If cancellation is made within 2 hours prior to the booking time, passengers will be responsible for paying the full fare. If cancellation is made within 48 hours for hourly booking over 2 hours, passengers will be responsible for paying the full fare. In case of emergency, passengers must call the booking hotline 2760-8771 to ask for any changes to the booking time if needed. Call Center will decide whether the booking time can be changed, according to the latest situation of cab fleet, especially concerns over whether drivers will be able to safely and punctually pick up passengers. Call Center reserves the right to refuse any changes to bookings. If the booking time needs to be changed and the ride to be finished before 4 pm, Call Center will endeavour to help but no guarantee is made. Any further changes will be subject to an administration fee of $100. If the booking time needs to be changed and the ride to be finished after 4pm, the booking is cancelled immediately and the passenger will be responsible for paying the full fare. The Call Center will then see if a new booking can be made after 4pm. In light of safety concerns, Diamond Cab reserves the right to refuse any wheelchair rider travelling alone on our cabs. To ensure the effective operation of our fleet and to encourage passengers to board on time, drivers reserve a right to demand a minimum waiting fee of $150 if a passenger is late for more than 15 minutes. ** Diamond Cab incurs a higher operational cost compared to conventional LPG-taxis as we run on gasoline and boarding time is longer for wheelchair users. We are privately-funded, not subsidied by the Government or any other public institutes, and drivers join as independent self-employed individuals. In order to continue our service, we must strive to be self-sustainable. When determining our fare , we take into account factors such as prices of similar service providers and the service quality of our fleet. 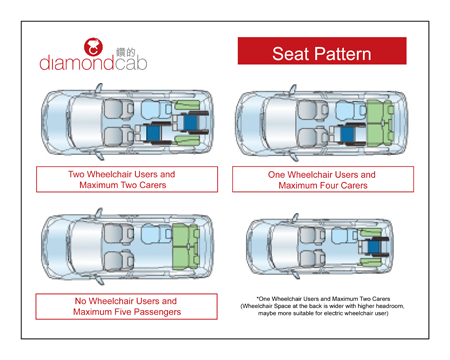 We begin with five Diamond Cabs as the starting point and if the market responses positively, we would consider the possibility of expanding our fleet to benefit more wheelchair users. Diamond Cab is the flagship social venture of SVhk, we believe the social investment could illustrate the perfectly blending of social and business values.